I received the book Taking Sudoku Seriously by by Jason Rosenhouse and Laura Taalman for review and put it aside to collect some dust. You see, I have solved too many Sudokus in my life. The idea of solving another one made me barf. Besides, I thought I knew all there is to know about the mathematics of Sudoku. One day out of politeness or guilt I opened the book — and couldn’t stop reading. The book is written for people who like Sudoku, but hate math. This is so strange. Sudoku is math. People who are good at Sudoku are good at math, or at least they are supposed to be. It seems that math education in the United States is so bad that people who were born to be good at math and to like math, hate it instead. So the goal of the book is to establish a bridge from Sudoku to math. And the book does a superb job of it. This well-written book moves from puzzles to discussions in such a natural way that math becomes a continuation of puzzles. 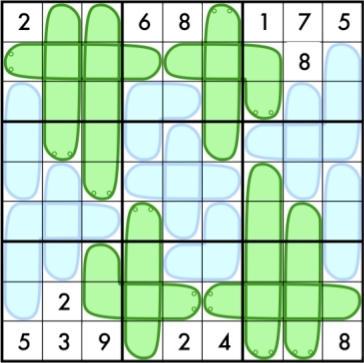 Taking Sudoku Seriously covers a lot of fun material: methods to solve Sudoku, how to count the number of different Sudoku puzzles, and how to find the smallest number of clues that are needed for a unique puzzle. The book travels into the neighboring area of Latin and Greco-Latin squares. While discussing all those fun things it covers groups, symmetries, number theory, graph theory (including book thickness) and more. I am not the target audience for this book, because I do not need convincing that math is fun. The best part for me was the hundred puzzles. Only a portion of them were standard Sudoku puzzles — and I skipped those. The others were either Sudoku with a twist or plain math puzzles. The puzzles are all very different and I was so excited by them, that I went ahead and solved them, and caught up with reading the text later. And I enjoyed both: reading and solving. Here is puzzle 91 from the book. Fill in the grid so that every row, column, and block contains 1-9 exactly once. In addition, each worm must contain entries that increase from tail to head. For blue worms you must figure out yourself which end is the head. Gosh, Tonya, what a nice review. I’m glad you enjoyed the book. That’s a great puzzle, interesting with the symmetry, which I think maybe makes it a bit too easy to solve. I feel sudoku is telling something about life, it’s really a kind of Zen! !